The Macintosh platform is basking in hardware superiority these days. The lightning-fast, competitively priced G3 machines eclipse the best from the PC-compatible world, with their laboring Intel CISC processors and still-clunky component integration. There is also much appropriate excitement on the Mac software side with OS 8 raising the bar several notches higher than did OS 7.x - which Microsoft's Windows 95 had not yet caught up to. Then there is the much-anticipated Rhapsody OS waiting in the wings. However, one of the most wonderful things about the Mac is that even the earliest 128K and 512K models - now 14 years old - are still useful, pleasant-to-operate computers, while your average five-year-old PC/Intel box is most useful as a doorstop. For instance, one of my offspring, resident tech-trogolodyte at the Maccave, has a 512Ke 800 that is still fully operable and in day to day use. The trick with these old machines is to use software designed for them, in which case they are still amazingly slick and fast. Contemporary versions of MacWrite or WriteNow are capable word processors for the type of writing most people do most of the time. It's hard to convince PC users that there is a functional and capable 1-bit graphics program (MacPaint) that will fit on a 400K floppy along with an operating system! There is even a version (1.5) of Microsoft's Excel spreadsheet program written for these machines, as well as a respectable selection of games. 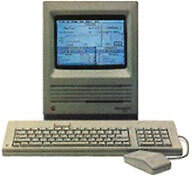 A collection of early Mac OS versions were written to run the 128K (Skinny Mac), the 512K (Fat Mac), and the Mac Plus from a single floppy drive. System 0.98 (!) through System 3 will work with all of them, and the 512Ke and Plus can handle up to System 6.0.8 on floppies. While the early HD-less Macs can function happily with a single floppy drive, they are more graceful with two, which cuts down the need for a lot of floppy switching. The quietness and speed of these very early, RAM-challenged, fan-less Macs is a revelation in contrast to their modern descendents running OS 7.5, 7.6, or 8 and bloated fatware like Microsoft Office. A step up from the very early Macs are the Mac Plus, Mac SE, and Mac Classic. The Plus was a transition model. It could run from floppies like the 128K and 512K, but was also equipped with a SCSI bus and port that allowed hookup to an external HD. The Plus was the first Mac with Mini-DIN 8 serial ports instead of DB-9 and the last that used the non-ADB mouse inherited from the Apple ll and Lisa. It came with a larger keyboard incorporating a numeric keypad and cursor keys and a whopping 1 MB of RAM that could be upgraded to 2.5 MB or 4 MB. The Plus can run up to OS 7.1 with 2.5 MB of RAM, and up to OS 7.5.5 with 4 MB. The SE and later the Classic retained the 8 MHz 68000 Motorola CPU chip but added internal hard drives, cooling fans that helped extend the video power supply unit's service life, and an ADB bus for input devices. These Macs shared the Plus's RAM configuration options. 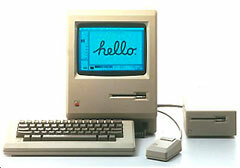 I have a 1988 Mac Plus with a platinum (as opposed to the earlier beige) colored case. It has been upgraded to 2.5 MB of RAM and has an external "MacCrate" 20 MB SCSI hard drive. The little hard drive is partitioned, with OS 7.1 on one side and OS 6.0.8 on the other. This machine was my first Mac, and I still use it for word processing and 72 dpi line art graphics work. The little 9 inch, 1-bit monochrome monitor in these one-box machines is small but wonderfully sharp. Software installed includes MS Word 5.1, MacWrite Pro 1.5, ClarisWorks 3, an early version of SuperPaint, HyperCard 2.3, and sundry small utility apps. Running System 6.0.8, Word 5.1 works very well, although opening, saving, and spell-checking are sluggish compared with the program's performance on faster Macs. Word 4 runs happily and speedily on the Plus, but I miss Word 5.1's drag-and-drop text editing too much to live without it. I boot from OS 7.1 when I need TrueType fonts for printing, but otherwise OS 6.0.8 is more than adequate, and significantly faster. The old Plus will even surf the Internet using the little MacWEB Browser (regrettably no longer being developed, but still available for download). Eudora 1.5.1 works great for email. The street price of these antique Macs is frequently $50 or less, and they can often be acquired for the asking from people who have long since moved on to more powerful Macs. The compact Macs were and still are great machines. In terms of clean and elegant industrial design, nothing Apple has built since really matches them. The Classics are appropriately named. For more performance in the same box, there are the 68030 Mac SE/30 and Classic II. The slightly larger and much more rococo Color Classic sports a jewel-like 10 inch Sony Trinitron monitor. Many lament the passing of the compact Macs, but in truth they were made redundant by another line of phenomenally successful small Apple computers: the superb PowerBooks.